The Corked Bat Collection is produced and distributed by the same people who run Charity Hop, LLC., a sports marketing firm that has helps athletes raise money for their favorite charity. A percent of proceeds from every Corked Bat sale will be donated to charity. Charity Hop was started by two Boston-based amateur baseball league teammates. Both were Northeastern University grads and marketing professionals with a combined 18 years experience in the field. Recognizing a glaring need for fundraising assistance to sports related organizations and charities, the duo started a full service consulting business in 2006. With a vast array of clients and causes, Charity Hop raised more than $1,500,000 in charitable donations from philanthropic events in local communities and national product launches. Charity Hop became famous for their partnership with Charity Wines and the release of Longball Cellars. These wines raised money for charity and featured prominent baseball stars of the past and today, ranging from Hall of Famers Mike Schmidt and Ernie Banks to current heroes Ken Griffey, Jr., David Ortiz and Chipper Jones. Every baseball fan knows that a corked bat is a modified baseball bat filled with cork to make the bat lighter without losing much power. A lighter bat gives a hitter a quicker swing and may improve the hitter's timing. How are corked bats related to wine? Charity Hop founders determined it would be a novel idea to sell Longball Cellars in corked bottles shaped like baseball bats. This idea was taken to Charity Wines for their consideration. Charity Wines explained that to sell wine in a bottle, regardless of shape, would require a liquor license. Logistically, shipping wine filled in a bat-shaped glass would be heavy and expensive. It was conveyed that wine shops would be hesitant to sell wine in an apparatus other than a standard wine bottle. There was also hesitation in the "Corked Bat" naming, as "corked wine" is an industry term for wine that has gone bad. So a new company was started and the concept of a bottle was transformed into a decanter to be sold at retail where glassware is sold. As a glass decanter, no liquor license would be required because it would be sold empty. Unfilled, this also eliminated weight and shipping barriers. Wine shops were no longer of concern, as the glass bats would be sold at national retailers and memorabilia shops. The cork topper was a clever finishing touch, as all wine bottles need a cork. Plus, a decanter serves a useful purpose, unlocking the hidden flavors and aromas of a wine. 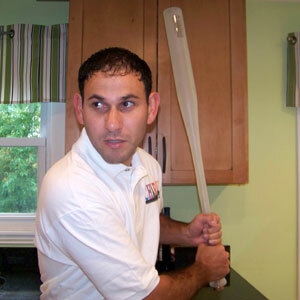 Corked bats are illegal in the game of baseball. Yet, the transformed Corked Bat Collection concept now followed every rule. As a glass container in the shape of a regulation adult baseball bat that decants, stores and pours wine, the Corked Bat is ready for the big leagues. Corked Bats are also a great way to display candy for birthdays and holidays. And of course, they also make great corporate gifts. Ready for the big leagues!